With a powerful 55.5cc engine and 20-inch bar, the 455 Rancher is one of the most popular top end models for homeowners, ranchers and farmers. Excellent anti-vibration technology, rugged build quality and the ability to take up to a 24-inch bar make this a truly versatile chainsaw that you can depend on for the most demanding landowner jobs. You will not find this kind of quality on a cheap chainsaw, but the Husky 455 is still not that expensive when you consider what you’re getting and sits comfortably in the mid-price range for a semi-professional chainsaw. We’re going to take a closer look to find out exactly what it’s got to offer and decide if this really is the perfect 20-inch chainsaw for homeowners as well as farmers and other landowners. What engine comes in the Husky 455 Rancher? What size bar and chain can you use in the 455 Rancher? How easy is it to adjust the chain tension? What safety features does the 455 have? 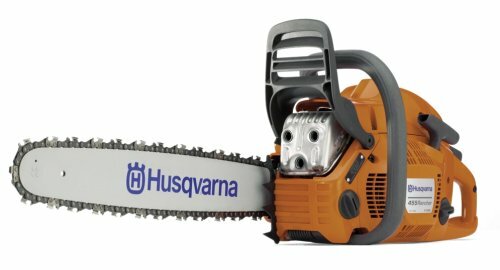 Is the Husqvarna 455 loud or heavy? Does this chainsaw cut down on handle vibrations? How easy is it to start and stop the 455 Rancher? Does this chainsaw automatically lube the chain? What routine maintenance will I need to do? What other features does the 455 have? Husqvarna has been making power tools for use on the land and in the forest for over 60 years so they know a thing or two about making solid, reliable machines. Their huge range of chainsaws is very popular and the 455 sits at the top end of their ‘All-Round’ saws which are branded as lightweight, efficient and easy to start. Although the 455 Rancher has many of the features and build quality of a professional grade chainsaw it’s worth noting that it’s aimed at the homeowner, farmer or rancher rather than for use as a commercial machine. The main difference between this type of saw and a truly professional one is the raw power and extra features to make it more durable and easy to use in the harsh world of a commercial contractor. If you’re after a quick rundown of the main specifications and features of the 455 Rancher, here’s a list of them so you can see at a glance what it’s got to offer. This saw is powered by one of Husqvarna’s own X-Torq engines that have been designed to cut fuel consumption by up to 20% and reduce harmful exhaust emissions by up to 75%. Not surprising then that this particular model is CARB compliant and meets many stringent emissions regulations around the world. A fast cutting speed of 9,000rpm means this model can make light work of most jobs around the home or farm. The X-Torq in this model is a 55.5cc engine developing 3.49hp of power which is enough to cope with most heavy-duty tasks. As with many chainsaws, this is a 2-stroke air cooled engine which provides the best power-to-weight ratio for a handheld outdoor power tool. That means the chainsaw runs on a mixture of 2-stroke oil and gas at the ratio of 1:50 (oil to gas). It’s recommended to only use gas with an octane grade of no lower than 87 otherwise, you could end up with serious engine damage. Another tip is to make sure to run-in the engine on a new chainsaw by not running it at continuous high speeds during the first 10 hours of use. The fuel tank is a little on the small size for a heavy-duty chainsaw at only 15fl oz. However, with the improved fuel economy offered by the X-Torq engine, you should still be able to get longer than 30 minutes continuous use before needing to top up. The fuel gauge window on this model makes it very easy to see if you’re getting low which is a help as well. The 455 model we are reviewing (model number 965 03 02-98) comes with a professional grade anti-kickback 20” chain with a 0.375” pitch and 0.058” gauge. This means it only has 72 links which is less than some other models, but as it’s a quality chain this should not make a lot of difference. Our review model comes with a 20-inch bar but it can take different bar lengths from 13 inches right up to 24 inches. This makes it a very versatile saw that could be used for anything from lighter duty jobs with a shorter bar up to felling large trees with the 24” bar. Keeping the chain sharp will not only make it work better but also prolong its life as well. You can tell when it needs sharpening as you may notice you need to apply more pressure to get the saw to cut through. Also, instead of producing nice big wood chips, the saw will be spitting out lots of small chips and vast amounts of sawdust. There is further information in the manual on how to sharpen the chain yourself, or you could take it to a dealer to have it done professionally. Either way, we recommend you always have a spare on hand just in case. The other important thing to do with regard to the chain is to always keep it correctly tensioned. On this chainsaw, you will need to use the included multi-tool (or scrench as it’s sometimes called) to adjust the chain tension but it is easy to do. Conveniently there are no covers to remove, just loosen the two bar retaining nuts and turn the tensioner screw that can be accessed on the side. Once the chain is not sagging along the bottom of the bar when you lift it by the tip, then tighten the nuts back up and you’re ready to go. Full instructions can be found in the user manual of course and make sure you take note of the safety advice. How to use a chainsaw safely should be one of the first things you learn about before pulling that starter cord. There are some very good chainsaw handling courses run by dealers and organizations all over the country so it’s a good idea to attend one of these to see how to handle one and avoid all sorts of nasty injuries. These days, chainsaws come with a few safety mechanisms to try and reduce the impact should a dangerous situation occur and the 455 Rancher has several as you might expect. The most dangerous problem faced by any chainsaw operator is that of kickback. This happens when the upper part of the tip of the saw touches an object and usually causes the chainsaw to bounce back upwards and backward towards the operator. As always, be sure to wear protective chainsaw chaps and all other protective clothing and equipment. There are two safety mechanisms employed on this model to help protect you if this should happen. The first is an inertia chain brake which activates when a rapid upward movement is detected, the second is the front hand guard which activates the chain brake when pushed forward. The movement caused by kickback will usually mean your left hand rolls forward and pushes the front guard activating this safety feature. Neither of these can be guaranteed to operate every time as there are just too many different situations that could cause kickback to occur. The best way to prevent injuries is to learn how to use the saw properly. There is lots more information in the user manual so make sure that the first thing you do is read it all the way through. • Throttle trigger lockout – this prevents you accidentally operating the throttle control. • Right-hand guard - this is the guard at the back of the chainsaw and helps protect the hand from a broken chain. It also stops branches or twigs interfering with your grip. • Chain catcher – this device is designed to catch the chain if it snaps or jumps off. Nearly all 2-stroke powered tools are going to be noisy, it’s just the way it is. Modern design improvements to the exhaust muffler have helped reduce the sound levels somewhat, but they will still reach around 104 dB(A) at the operator’s ear. This means you need to wear ear defenders at all times to protect your hearing from damage. Without any cutting equipment installed, the 455 Rancher weighs just under 13lbs (5.9kg) which is reasonable for a heavy-duty chainsaw. It does mean that it’s too heavy to use when doing something like limbing (removing the branches from the stem of a fallen tree) where you tend to be working with the saw for extended periods. Using something like this for light pruning duties is probably a bit of an overkill as well. This model comes equipped with the Husqvarna LowVib system, which really does help to reduce the vibrations felt at the handles by quite a margin. It does this by insulating the handles from the body of the saw with vibration damping units. This reduces the transfer of vibrations from the engine and cutting equipment to the handles and on to the operator holding it. The official vibration levels have been measured at 3.4m/s2 at the front handle and 4.5m/s2 at the rear, which is pretty impressive for a chainsaw with this much power. Compare that to other brands and you will see what we mean. Note that using blunt or damaged cutting equipment can increase these levels significantly, so make sure you keep the chainsaw well maintained. Why is all this important? Well, continued exposure to vibration can lead to nerve damage and a condition known as vibration white finger or HAVS (hand-arm vibration syndrome). This can result in numbness, loss of feeling, changes in skin color and other unpleasant symptoms so it’s important to do everything you can to prevent it. Another tip is to use anti-vibration gloves which we will cover later on. There are several features on the 455 that all help to make starting the chainsaw a good experience. One innovation is the Husqvarna SmartStart system that reduces resistance in the recoil cord by up to 40%. Another is the combined stop/choke control that reduces the risk of the engine flooding. The air purge bulb, decompression valve, and fuel pump make up the rest of the components designed to aid an easy start and according to many of the reviews we’ve researched, they do a good job. Most owners find that the 455 starts very well, nearly all the time. One caveat though, make sure you read the manual and follow the instructions, particularly in relation to using good quality fuel. If you do this, you will be unlikely to experience any of the starting issues that have been reported in a few isolated cases. Stopping the chainsaw is equally as straightforward. Just push the stop switch down and the engine will shut off. Note that as this is an auto-return type switch it will return to the start position automatically ready for when you next want to fire it up. Keeping the air filter clean is one of the many regular jobs you have to do on a chainsaw to keep it running properly and anything that reduces dust getting to the filter in the first place is going to help. Husqvarna has developed a centrifugal air cleaning system for their chainsaws that does exactly this and the 455 comes equipped with this feature. Basically, the system removes larger debris and dust particles from the air by routing it past the starter before it even gets to the air filter. The cooling fan pushes out those particles that would otherwise clog up the air filter, resulting in longer life for both the filter and the engine. Of course, the air filter still needs to be checked regularly but it will not need as much cleaning or be replaced so often. Access to the filter is via a clip-on cover and quick release mechanism so it’s very fast and simple to do. Apart from keeping the chain tensioned correctly and sharpening it when needed, it’s vitally important to keep it lubricated properly at all times. This used to be a bit of a pain in days gone by but now many chainsaws are fitted with some form of automatic chain oiler. The Husky 455 is no exception and has a quality oiler system with an adjustable oil pump. This allows you to adjust the oil flow depending on the conditions you are working in. There is a 10fl oz oil tank that will need to be kept topped up as well as making sure the oiler is working correctly. You can quite easily check this by running the chainsaw at speed whilst pointing it at a light surface such as the top of a tree stump. After a few seconds, you should see a spatter of oil from the chain on the surface which indicates the oiler is working. This chainsaw comes with a 2-year warranty if used for personal, household use or 90 days for commercial use. 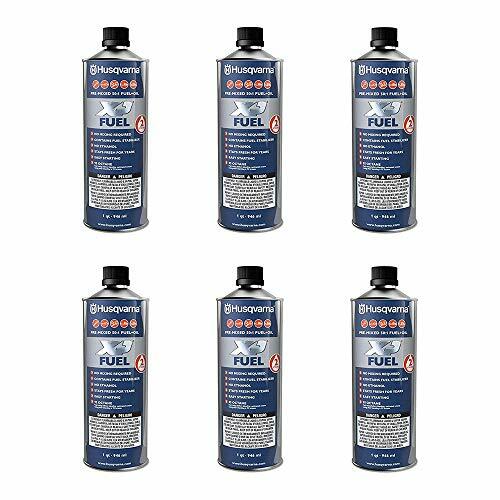 If you purchase 3 x 32oz cans of Husqvarna pre-mixed fuel at the same time and from the same place, then you can extend the homeowner warranty to 4 years free of charge when you register the product online. Note that both the chainsaw and fuel must appear on the same receipt to be valid. A properly maintained chainsaw will not only last a lot longer but is also much safer to use. There are checks you should make before using it each time such as oil levels, chain tension, air filter condition, checking the chain brake works etc. etc. There are also regular checks you should do at certain intervals such as checking fuel hoses, cleaning the spark plug and turning the guide bar amongst other things. These are all described in the manual so once again, we implore you to read it through and make sure you know exactly what you need to do and when. We’ve covered most of the features now but there are a few we haven’t mentioned yet so we’ll take a quick look at those now. This chainsaw has distinct felling marks molded into the cover for more precision when felling a tree. Basically, when cutting the felling notch, you line up the mark on the cover in the direction you want the tree to fall, very much like sighting a gun. You can also use them the same way when making the back-cut. The 455 also has a three-piece forged crankshaft which provides for maximum durability. This prolongs the life of the crankshaft even when used for some of the toughest jobs. Last but by no means least is the ergonomic front handle which has an improved grip as well as a 7o offset to help reduce operator fatigue. There are few items of protective safety gear that are absolutely essential and you should not use a chainsaw without them. 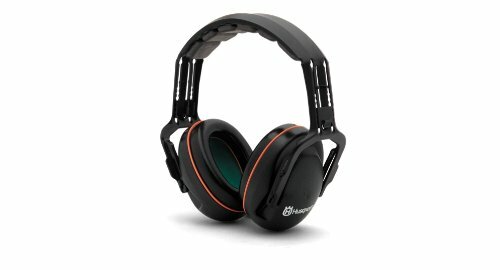 The first item is one we’ve already mentioned and that’s a good set of ear defenders. Exposure to the loud 2-stroke engine can affect your hearing in no time at all. Next is a pair of safety glasses or goggles and a helmet. You can find all three items in one package on the safety helmets that you can buy these days. 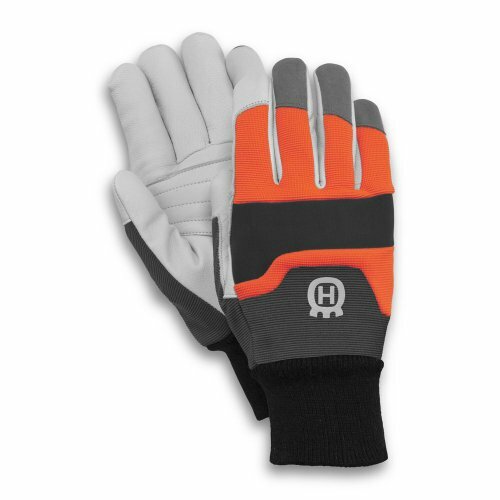 The next item we’ve also mentioned earlier and that’s a good pair of anti-vibration gloves. Even though this model has very good vibration damping, a set of these made especially for chainsaw use will make sure you’re doing the most to prevent HAVS. 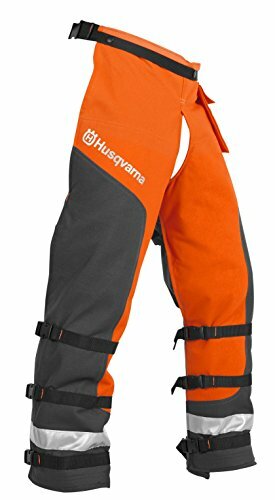 An essential addition to your safety equipment is a pair of chainsaw chaps or a chap apron. These protect your legs from a severe wound should the saw come into contact with your leg whilst still running. Check out this video to see the sort of protection they can give you. Next up we recommend you get some non-slip protective footwear and hard wearing work clothes which should not be loose or baggy. Finally, think about getting a dust mask or some other form of respiratory protection if working in a dusty environment. You can find lots more information on safety in our article on chainsaw safety tips. What are the consumer reviews like for the Husky 455 Rancher? There are lots of reviews online for the 455 as it’s such a popular chainsaw and overall the impression is very positive. Many reviewers have used the chainsaw for a long time and in lots of different situations with very few problems reported. Unlike the Husqvarna 450 chainsaw review here, the user manual for the 455 Rancher is very clear and has easy to follow instructions for every little detail. We also recommend watching the Husqvarna videos on getting to know your chainsaw for more easily digestible information. Well, have we answered our original question on whether this is the perfect 20-inch chainsaw for homeowners? The answer is probably yes – but as always it depends a great deal on what you need it for. The Husqvarna 455 Rancher may have just too much power for some homeowners and they might never get to use it to its full capacity. If you are a homeowner, farmer or rancher with a lot of land and you need a powerful chainsaw that’s rugged and quick cutting, then the 455 Rancher is going to be perfect for you. For everything else check out our article on the Best 20-inch Chainsaws for Homeowners to find an alternative that might suit your particular needs. You may also like to have a look at the Husqvarna 460 review here.